The number of people in work rose marginally in 2013 according to a new labour report released today. 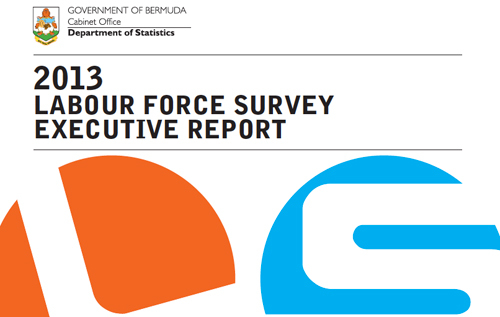 The 2013 Labour Force Survey revealed that employment in Bermuda increased to 35,989 in 2013 from 35,874 in 2012. While the study also found that last year's unemployment rate was 7 per cent – a drop of one percentage point from the previous year. The unemployment rate was measured during the week of 13-19 of May when 2,569 people were looking for work. The 2013 data also shows that there were 27,309 Bermudians and 5,443 non-Bermudians in the workforce. The proportion of Bermudian workers at 76 per cent was identical to that reported in 2012. According to the new survey the median gross annual employment income rose 6 per cent from $58,698 to $62,211. While the average number of hours worked per week in the main job increased to 41 hours. • Employment increased to 35,989 in 2013 from 35,874 in 2012. • The unemployment rate was measured at 7% in 2013. • Unemployment was lower at 2,569 persons. • The average number of hours worked per week in the main job increased to 41 hours. “While we appreciate that the Labour Force Survey is simply an indicator, we are cautiously optimistic based on today’s information that there are signs that the economy is stabilizing. The Government will continue to implement programmes and initiatives aimed at stimulating our economy, which will eventually lead to job growth.” ~ Minister Michael Fahy.